The job of the immune system is tricky, requiring a careful balance. The immune system must seek out and destroy viruses, bacteria and cancer cells using an army of aggressive cells and molecules. But at the same time, this response must be held in check, to ensure that the immune system does not attack our healthy cells and cause autoimmune diseases. The immune system achieves this balance by combining many molecular interactions to tune each immune response. The centerpiece of the cellular immune response is the communication between an infected cell and a T-cell, mediated by MHC and T-cell receptors. In 1996 through 1998, this interaction was revealed in several crystallographic structures, including the one shown here from PDB entry PDB entry 2ckb. 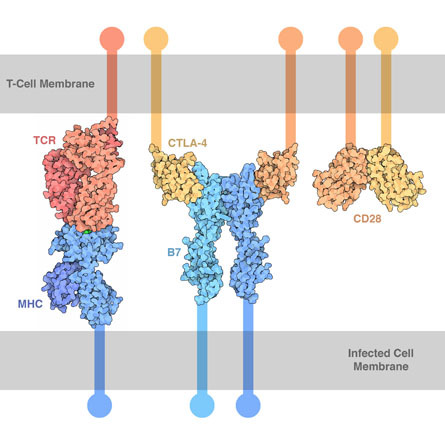 MHC displays a small peptide cut from the infecting virus, which is recognized by the T-cell receptor and ultimately activates the T-cell and mounts the immune response that will kill the infected cell. Building on this central transfer of information, a variety of interactions guide the strength and duration of the response in a process known as costimulation. These interactions are formed between molecules on the two cells, which come together when the T-cell binds to the infected cell. For instance, CD28, which is commonly found on the surface of T-cells, binds to B7 ligands on the surface of the infected cell, leading to activation of the T-cell and clearance of the infected cell. In the next three or four days, the T-cell then starts making CTLA-4, which sends an inhibitory signal. As it becomes displayed on the T-cell surface, it competes with CD28, ultimately shutting down the immune response before it gets out of control. This process has been revealed in several crystallographic structures, including a structure CD28 (PDB entry PDB entry 1yjd) and the complex of CTLA-4 and B7 (PDB entries 1i8l and 1i85). The molecules all have an extracellular domain connected to a transmembrane segment and a small intracellular domain. To determine the structures of these molecules, researchers typically cleave off the flexible membrane-spanning portion (which is shown schematically here) and work with the stable extracellular portion. As you might imagine, these molecules are highly conserved, since they are essential for the proper communication between immune system cells. Ironically, this makes them sensitive targets for viruses, which use them as receptors to bind to the cells they infect. This process has been revealed with a series of structures. PSI researchers recently determined the structure of the interaction between CAR, which is found on many types of cells, and JAML, which is found on immune cells, showing how these molecules communicate during a normal immune response (shown on the left from PDB entry 3mj7). 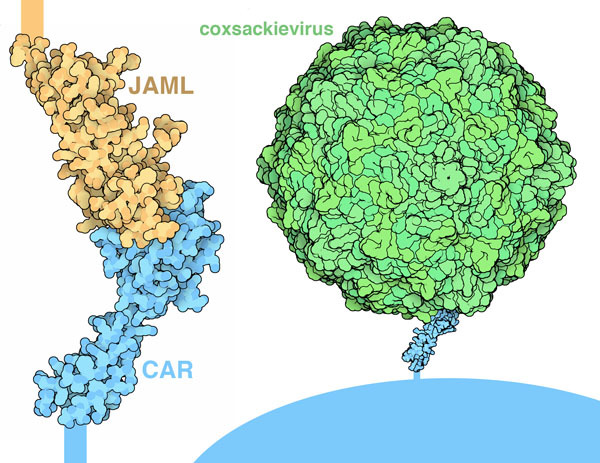 CAR, however, is also the target of viruses, such as coxackievirus, as shown in the cryo-EM structure in PDB entry 1jew. PSI researchers have determined the structure of another of these costimulatory interactions, between PD-1 and PD-L2 (PDB entry 1jew). PD-1, found on T-cells and other cells of the immune system, relays inhibitory signals and is important in the process of peripheral tolerance, where the immune response is controlled in the various tissues of the body. As with many molecules of the immune system, the proteins fold into a series of immunoglobulin folds, which then mediate the interaction between cells. To explore this interaction in more detail, the JSmol tab below displays an interactive JSmol. The extracellular domain of PD-1 is shown in pink and the extracellular domain of PD-L2 is shown in blue. Notice the similar immunoglobin fold of each domain, with two layers of beta sheets connected by a disulfide linkage at the center (shown in yellow). Use the buttons to display a spacefilling representation that shows the interaction between the two proteins. Verdino, P., Witherden, D. A., Havran, W. L & Wilson, I. A. The molecular interaction of CAR and JAML recruits the central cell signal transducer PI3K. Science 329, 1210-1214 (2010). Chattopahhyay, K. et al. Sequence, structure, function, immunity: structural genomics of costimulation. Imm. Rev. 229, 356-386 (2009). Lazar-Molnar, E., Yan, Q., Cao, E., Ramagopal, U., Nathenson, S. G. & Almo, S. C. Crystal structure of the complex between programmed death-1 (PD-1) and its ligand PD-L2. PNAS 105, 10483-10488 (2008). Evans, E. J. et al. Crystal structure of a soluble CD28-Fab complex. Nat. Immunol. 6, 271-279 (2005). He, Y. et al. Interaction of coxsackievirus B3 with the full length coxsackievirus-adenovirus receptor. Nature Struct. Biol. 8, 874-878 (2001). Schwartz, J.-C. D., Zhang, X., Fedorov, A. A., Nathenson, S. G. & Almo, S. C. Structural basis for co-stimulation by the human CTLA-4/B7-2 complex. Nature 410, 604-608 (2001). Stamper, C. C. et al. 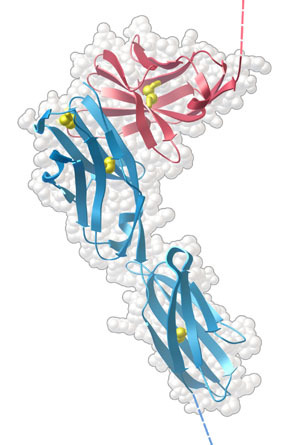 Crystal structure of the B7-1/CTLA-4 complex that inhibits human immune responses. Nature 410, 608-611 (2001). Garcia, K. C. et al. Structural basis of plasticity in T cell receptor recognition of a self peptide-MHC antigen. Science 279, 1166-1172 (1998).